Tough House is a customer centered concrete specialist firm. We provide solutions to decrease water permeability and increase shear strength, elasticity, ductility, durability, resistance to rusting and micro crack resistance for concrete. We do this in a way that overall price is reduced and life of the structure significantly increased.Tough House offers free design evaluation with qualified local team of architects and engineers and final design approvals from manufacturers abroad of the relevant construction materials. The use of our recommended construction materials translate to lower maintenance costs, guaranteed integral waterproofing , increased resistance to earthquakes due to increase strength of concrete and other qualities and in most cases it encompasses lower construction cost as well due to integral water proofing and reduction in rebar/labor cost etc. Helixsteel : Helixsteel micro rebar Helix recently earned IAPMO’s Uniform Evaluation Service (UES) Evaluation Report ER-279 on Helix 5-25 Micro-Rebar. Helix Micro-Rebar 5-25 is the only discontinuous concrete reinforcement product in the world that now has a ISO certified design manual that can be followed to design vertical applications (such as walls) with Helix as the primary concrete reinforcement.
. Tough House is distributor of Helixsteel micro rebar system in Pakistan and offers free design evaluation services as approved by Helixsteel USA. 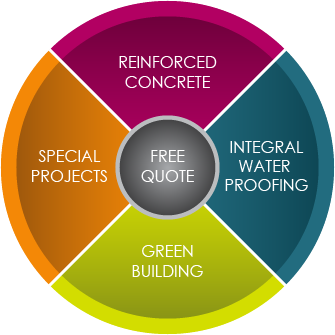 Integrated Water Proofing : Tough House has introduced the integral water proofing concept in Pakistan. The admixture is directly mixed in concrete and the whole concrete acts like a water barrier doing away with flimsy membrane based water proofing. We provide free design evaluation in consultation with the manufacturer. Our admixture are North American based and considered best in the field used world wide.